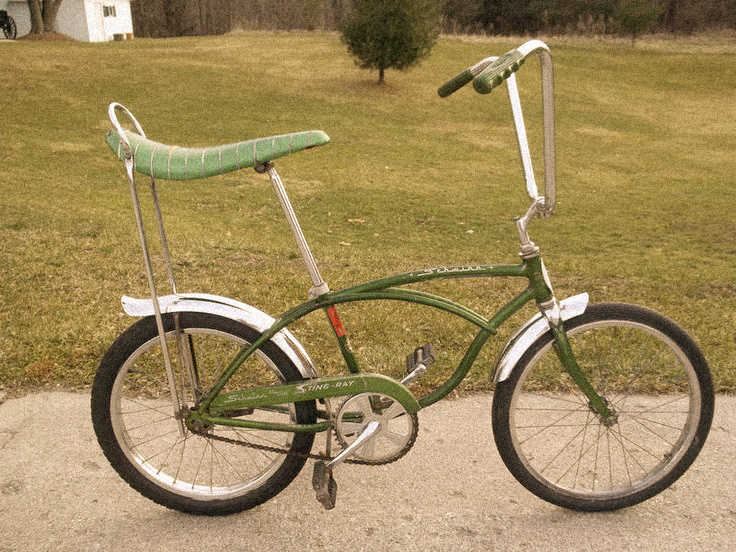 The very first bike I ever owned was a green Schwinn Stingray coaster bike with a sparkly green vinyl banana seat, V-shaped handle bars with green plastic grips, a sissy bar, chrome fenders and black tires. It was the late 1960’s, and I’m guessing that I was probably about six or seven years old. My parents bought it for me. And it’s the one on which I learn to ride a bike. After I learned to ride a bike I remember riding it constantly. I would ride on the sidewalks and the streets. I would ride through yards. I would jump curbs and do wheelies. I would ride really fast and then slam on the breaks to see how long of a skid mark I could make. And when I would go out to play with my friends, I would find them by riding around the neighborhood looking for the house with all the bikes in the yard. I don’t know whatever happened to that bike just like I don’t know what happened to my baseball cards, toys, and favorite T-shirt from when I was growing up. I assume my parent got rid of it or just threw it away at some point. I sure wish I still had it though. In mint condition it might be worth as much as all my other bikes combined. 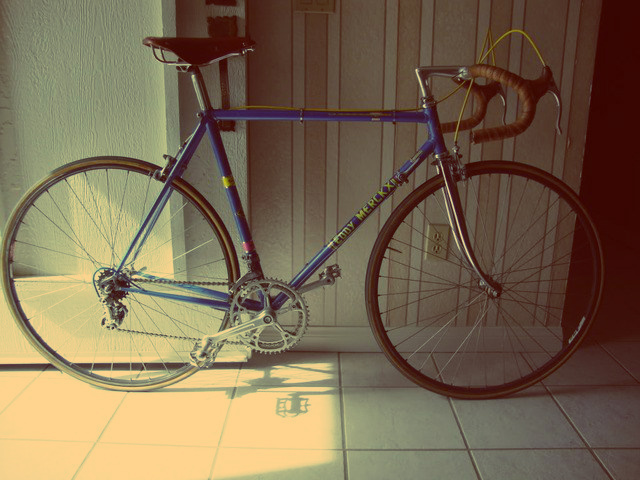 My second bike, and the only other bike I owned prior to when I started riding again later in life as an adult, was a blue Eddy Merckx 10-speed that I had in the mid 1970’s. That bike gave me a greater level of independence because it made the world seem smaller and more accessible, thus enabling me to venture out of my neighborhood, going farther and faster than I had ever done before on my own. I also used my ten-speed bike to deliver newspapers on my paper route after school during the week, and early in the morning on the weekends. Sadly, I do remember what happened to this bike. It was stolen off of the front porch of my family’s house. I still remember the feeling that came with the realization that it had been stolen. With my Dad’s assistance, we reported it to the police. But we had little hope of the person who stole it actually being caught or the bike being recovered. Surprisingly, about a week later a police officer stopped by our house and told us that they had caught the thief, and that he had the bike in his possession at the time he was apprehended. However, they said the bike was damaged. And damaged it was. The officer said they had arrested the thief for shoplifting at a local department store. But when they went to put him in the squad car to take him to the police station he told the officers that he had his bike with him. When they saw the bike it was obvious to them that it had been stolen because the thief had attempted to paint it another color. He had taken a can of orange spray paint and painted the entire bike, including the seat, the handlebars, the gears and the chain. Everything. So they checked the serial number of the bike against the stolen property reports and ended up charging him with stealing the bike in addition to shoplifting charge. He was convicted on both counts. And since the bike was so damaged he was ordered to pay restitution to me for the value of the bike. I never saw that money though because before he had the money to pay me he was arrested and convicted of additional crimes and sent away. I imagine at this point he is probably in prison again somewhere, where he would not be allowed to ride a bike even if he wanted to.